Positively Oconee, a citizen group concerned with the proposed widening of U.S. 441 in the south of the county, is inviting people to a program Wednesday evening on the proposed Bishop Bypass, the land the roadway will traverse, and Greenbriar Creek, which the bypass could cross. The event will begin at 5:30 p.m. at the Thomas Cotton Gin, 3782 Greensboro Highway (SR 15), south of Watkinsville, and the first 100 persons in attendance will receive a complimentary BBQ dinner. On Thursday night, Oconee County’s two Rotary Clubs will hold a candidate forum and discussion of the Education Special Purpose Local Option Sales on the November ballot. The forum will start at 7 p.m. at the Student Resource Center, Room 522, at the University of North Georgia campus, off Experiment Station Road just east of Butler’s Crossing. On Oct. 26, the Oconee County Board of Commissioners will hold a Water Resources Forum, starting at 6 p.m. at the Community Center in Veterans Park. The program include presentations by county consultants Carter & Sloope, Crowder Construction and Precision Planning Inc. The three meetings are interconnected in that one of the three Board of Commissioners candidates at the forum on Thursday night likely will be asked to have some impact on the Georgia Department of Transportation as it selects a route for the widened U.S. 441 and certainly will have to decide on water and sewer issues in the county. The three meetings are open to the public. The meeting on Oct. 26 on water resources is the outgrowth of a decision by the Georgia Environmental Protection Division not to grant the county a requested waste load allocation of 3 million gallons per day for Calls Creek. Oconee County Utility Department Director Wayne Haynie announced his tentative plans for the meeting at the Board of Commissioners meeting last Tuesday (Oct. 4). The goal is to get citizen input on the decisions confronting the county, which include the possibility of putting a sewer line down Calls Creek to handle increased effluent from the county’s Calls Creek wastewater treatment plant on the northern edge of Watkinsville. Haynie told me in an email message on Friday that Carter and Sloope, with offices in Butler’s Crossing, will talk about forecasts for county water and sewer services, that Crowder Construction of Conyers will talk about the proposed plant expansion, and Precision Planning of Monroe will talk about pipelines. The program organized by Positively Oconee for Wednesday night will include presentations by members of the local Audubon Society, according to Lisa Douglas, who owns a farm on the west side of Bishop and is one of the organizers of the event. The focus will be on the habitat of Greenbriar Creek, which lies east of Bishop and would be crossed several times if GDOT follows a route for the Bishop Bypass it identified as a preferred route in meetings with county officials last year. “The evening is about connecting with one another and connecting us all to the land,” Douglas said in an announcement of the event. 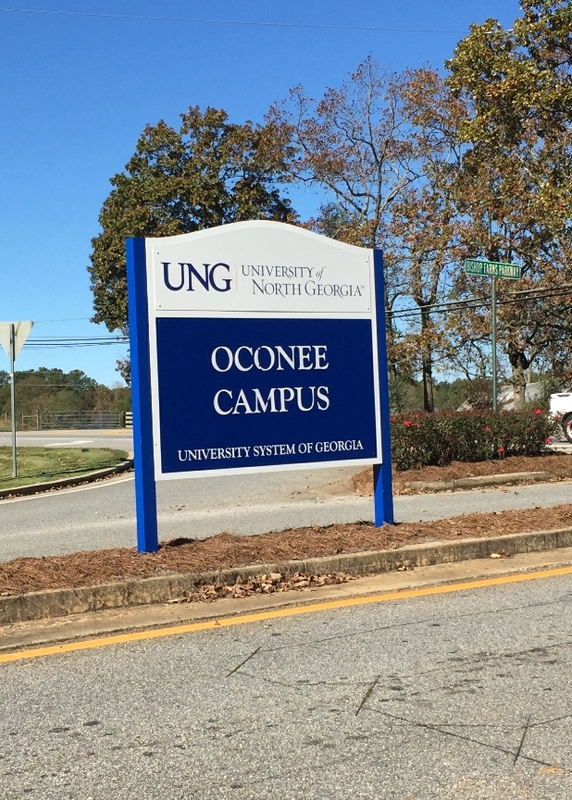 The Oconee County Rotary and North Oconee Rotary are organizing the candidate forum on Thursday in conjunction with the University of North Georgia Student Government Association. University of Georgia Political Science Professor Charles S. Bullock III with moderate the event. Ben Bridges, Chuck Horton and Marcus Wiedower, all seeking to fill Post II in a special election on Nov. 8, will be in attendance. Bridges, Horton and Wiedower are running as Republicans and seeking to complete the term of John Daniells, who resigned his position in March to run for the Board of Commissioners chairmanship. Daniell is unopposed on the Nov. 8 ballot. Dr. Jason Branch, superintendent of the Oconee County School system, will discuss and answer questions about the renewal of the 1 percent sales tax for educational capital projects. The first and only other election forum for the November election took place on Sept. 15. Individual hour-long interviews with Bridges, Horton and Wiedower are available on Oconee County Observations. Folks, this is your chance to give input into a situation that has cause a lot of uproar. Use this opportunity to offer sound solutions, not raise hell and disrupt the meeting and achieve nothing. I wish we had more meetings with the Director like this in Clarke County. Good of Hayne to do this.